HKTDC Director of Research Nicholas Kwan (centre), HKTDC Assistant Principal Economist (Global Research) Louis Chan (L) and HKTDC Economist Doris Fung (R) announce today the HKTDC Export Index for the second quarter of 2018 and discuss the latest global market outlook. HONG KONG, Jun 20, 2018 - (ACN Newswire) - The HKTDC Export Index for the second quarter of 2018 (2Q18) climbed to a 29-quarter high and indicated positive sentiment among local exporters for the first time in 12 months, the Hong Kong Trade Development Council (HKTDC) announced today. The 2Q18 reading stood at 54.1, up from 49.4 in 1Q18. The results suggest that Hong Kong exports are likely to sustain their growth momentum over the near term. However, exporters' optimism is laced with caution, given the current trade issues between the Chinese mainland and the United States. HKTDC economists forecast Hong Kong exports to grow six per cent in 2018. The HKTDC Export Index monitors the current export performance of Hong Kong traders and gauges their near-term prospects. Readings above and below 50 indicate positive and negative sentiment respectively. Among major sectors, the indices for electronics and machinery performed exceptionally well, reaching 55.2 and 54.9 respectively in 2Q18, their highest levels since early 2013. Toys continued its uptrend seen in the last two quarters, rising to 53.2. Clothing, while staying in contractionary territory, also showed signs of improvement in 2Q18 with a 17-quarter high reading of 43.6. Meanwhile, prospects appeared relatively less strong for timepieces (49) and jewellery (41.3), which posted lower readings than in 1Q18. 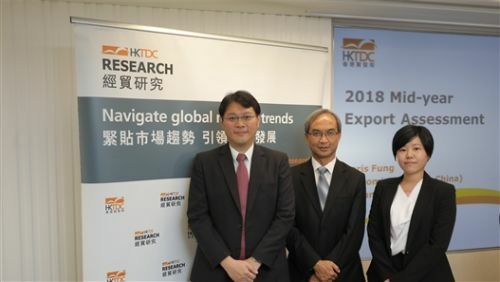 "Overall, Hong Kong exporters have shown a strong reversal in sentiment," HKTDC Director of Research Nicholas Kwan said at today's press conference. "Despite the mixed performances across sectors, exporters were generally positive about the outlook for major export markets." Further confirming the improving overall export sentiment, the Trade Value Index (54.6), Procurement Index (57.3) and Employment Index (53.2) all stayed above the watershed of 50. The European Union returned into expansionary territory for the first time since 2011, outperforming other major markets with the highest reading of 54 in 2Q18, up from 49.1 in 1Q18. Close behind was the Chinese mainland, with its reading rising further to a 29-quarter high of 53.8. Similarly, exporters showed strong confidence in the Japan (51.3) and US (51.2) markets, with both indices at their highest in recent years. HKTDC Economist Doris Fung noted that exporters' optimism was laced with caution, given the current trade issues between China and the US. The 2Q18 survey revealed that about half of the respondents (55.4%) remained confident that the trade dispute would not have any impact on their exports, whereas 35.8 per cent expected it to have a slightly negative impact. According to the survey results, any impact of the Sino-US trade friction has yet to materialise. More than 70 per cent of respondents (77.4%) said the dispute has not affected their exports so far, while about one-fifth of the exporters believed they would have achieved better performances if the trade dispute had not occurred. Meanwhile, Hong Kong's total exports grew by 9.3 per cent year-on-year in the Jan-April 2018 period, following an eight per cent growth for the whole of 2017. As regards traditional markets, exports to the US (+8.5%) and EU (+10.2%) increased strongly while the growth of exports to Japan (+5.3%) moderated in the first four months of 2018. "Following a strong rebound in 2017, Hong Kong's total exports continued to perform well in the first four months of 2018 given the solid and broad-based recovery in the world economy. Both private consumption and business investment in developed markets have continued to support growth," Ms Fung noted. In view of the new business opportunities arising from the Belt and Road Initiative, Georgia, an economy in the Caucasian region of Eurasia participating in the Initiative, is becoming more important as Hong Kong's potential trading partner, according to a recent HKTDC Research study. Louis Chan, Assistant Principal Economist (Global Research), HKTDC, said Georgia, with its strategic location at the crossroads between China and Europe and its being an open, business-friendly country in the region, can bring business opportunities for Hong Kong. "Georgia's GDP [gross domestic product] has grown at an average annual rate of almost six per cent in the past two decades, thanks to its business-friendly environment, liberal trade policy as well as low corruption and crime rates," said Mr Chan. The country has free trade agreements (FTAs) with the Chinese mainland (effective since 1 Jan 2018), Commonwealth of Independent States (CIS) countries, European Free Trade Association (EFTA) members, European Union (EU) countries and Turkey, while it also enjoys Generalised System of Preferences (GSP) preferential treatment by Canada, Japan and the US. Mr Chan added that with the upcoming conclusion of a Hong Kong-Georgia FTA, the country would present further opportunities for Hong Kong businesses as an export market and a logistics hub. In 2017, the CIS, EU, and Turkey accounted for 75 per cent of Georgia's trade, while the Chinese mainland was fast gaining a foothold, accounting for 9.2 per cent of its imports and 7.6 per cent of its exports, according to statistics from the National Statistics Office of Georgia. During a recent trip to Georgia, HKTDC Research found that the country's four-point reform plan -- which covers mainly energy, roads, agriculture and municipal and regional infrastructure -- is key to its transformation from a transit hub into a logistics and industrial centre, which will in turn support the development of start-ups and start-up financing mechanisms. The Anaklia Deep Sea Port construction, the Baku-Tbilisi-Kars Railway project and the expansion of the country's East-West highway are some of the milestones of Georgia's international connectivity enhancement efforts. "Businesses in the country are ready to export their unique fashion items, food and wine. Hong Kong businesses are advised to capitalise on Georgia's potential as a trading partner and an investment destination," said Mr Chan.